At night you can almost touch the stars over Lindos. I first heard about Greece at the age of five or six. The moment I laid eyes on the book “My donkey Benjamin,” a story about a little girl that finds a baby donkey in Lindos on Rhodes. I started to call all donkeys by that exact name and imagined Greece to be one of these magical far flung places. I'm visiting Greece for what feels like the thousands time. The last time I went is only a few months ago, when I went to Athens to go on a culinary safari and to look at Street Art. If you travel through Europe in summer it usually is so very busy, crowded, fun mayhem. Call it whatever you like. Everybody is out and about. For people living in the cold countries of Europe, summer is the time to celebrate. After months and months of grey, rainy, snowy, darkish times people want one thing: sunshine. When I booked my flight to Rhodes I was prepared for all the craziness that comes with a European summer vacation. As the plane flies over the Mediterranean Sea I let my view gaze over the endless blue, there are many islands, like hover boats silently floating in the flat sea. This is thanks to the slightly hazy conditions. I already used the word blue. Greece, the Greek flag is white and blue and so is the scenery, all the way to the horizon. It looks beautiful from above. I pick up my rental car at Diagoras Airport and adjust the surfing equipment on the roof and head towards Lindos. Rhodes Old Town would have been a great choice for a base too, food and nightlife are both great here but I wanted to stay in a small village and closer to Prasonisi, an excellent spot for wind- and kite-surfing. Lindos is an island in the Dodecanese in Greece. 1,000 people call Lindos, one of these picture perfect Greek villages, home. 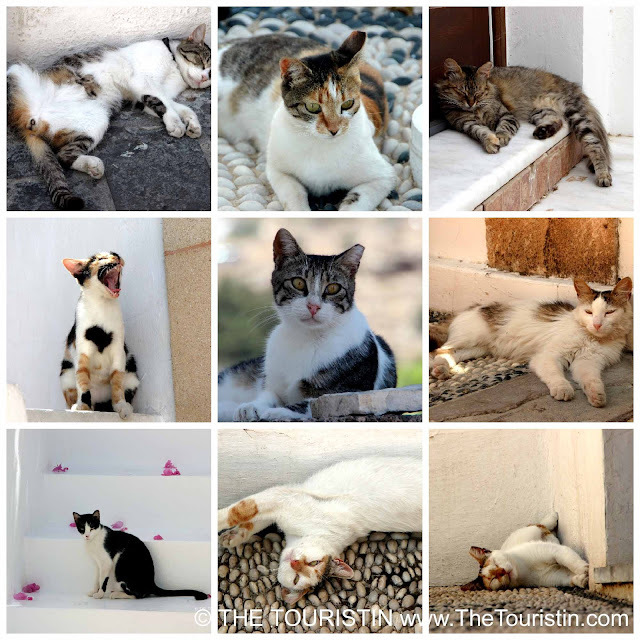 White houses, pink bougainvillea, sleeping cats, fig trees plus ancient history. I’m forever intrigued as to whether life is better in a small village or in a large urban environment with a high population density? In the eighties of the last century the Lindians decided to make the most of tourism, and they rented out every single room they had, probably even down to their broom cabinets. Over the decades tour operators, mostly from the UK took over the ancient white village. I have been several times to Lindos over the years, and this time it feels as the Greeks would want to take it slowly into another direction. If you go away on a trip, any trip really, the experience comes to life if you speak with as many locals as possible. It also pays off to walk into the opposite direction. There is beauty everywhere in this ancient village. I spend my time swimming, hiking, surfing, eating, shopping, sipping coffee and cuddling cats. I went to bed late and got up early. 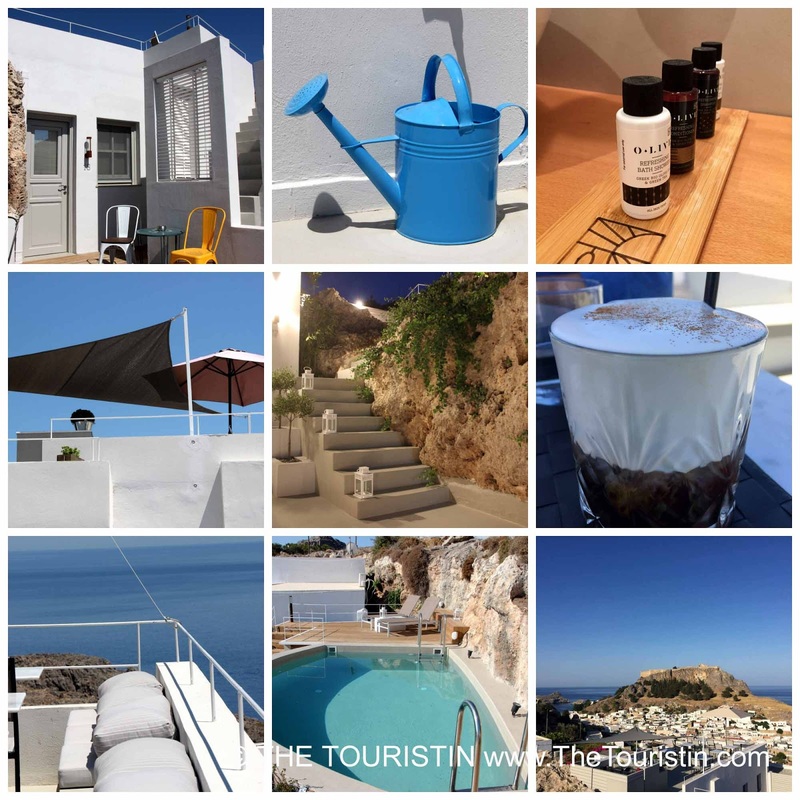 Here are my top tips for wonderful experiences in Lindos. Chopped walnuts, cloves and cinnamon, spun delicately in filo pastry shreds, lightly bathed in syrup, made from honey or sugar, is a classic Greek dessert. Kataifi is a tiny piece of art and if you can bring yourself to cut it up, rest assured that it is absolutely yummy to have it for coffee and cake in the afternoon. Yogurt producers enrich milk with yogurt cultures (lactic acid and bacteria) and then let it drain to separate the whey from the yogurt. The result is a thick and creamy yogurt that consists of ten percent fat and tastes less sour compared to plain yogurt. Make your way to Gelo Blu (a café that has been here for as long as I can remember) in the morning, find a place in the shade in the pretty white and blue courtyard and order a Greek Yogurt with honey and walnuts. The yogurt of a thick texture, which can be mixed with the honey wonderfully, will keep you well-fed till lunchtime, but you might consider checking their menu for more delicacies. Travellers want to get lost; at least that is what literally everybody who knows a thing or two about travelling tells them it is what they want to do. The village of Lindos is simply too small to seriously lose orientation. Just look at all the white there is, Lindos is an ancient white village, take the time to look for lovely photo opportunities and just enjoy the tranquillity of all the many deserted lanes fringed with white cubic houses and huge wooden entrance gates. A heavenly smell of olive oil floats gently through the air. If you are into cooking, this store is for you. The wide range of cutting boards, spatulas, honey dippers, bowls, spoons, ladles, pestle and mortars, citrus reamers, is arranged orderly all over the store, on the counter, on shelves, on the floor, on the walls. The olive wood is a hardwood and as such non-porous and what I especially love is that it doesn’t absorb bacteria. It is a tough decision; each piece is unique. I'm fascinated to hear that experts can tell from the pattern, from which part of the tree the wood was cut. You find the store if you walk up towards the Acropolis, it is next to the Captain's House Bar (stop here for a Frappé to cool down, it is an amazing property and so very friendly). Kori means girl in Greek. But this store is not only for girls, it is for everybody who loves beautiful handmade Greek products. If you enter the store on one of the main arteries in the village make sure you talk to the lovely owner and cuddle the very cute cat. I bought a knitted matiasma, the evil eye for EUR 29. Just in case someone will throw an evil eye on me, I have help now, it apparently wards off bad luck and it looks beautiful. In summer the store will be open till 11pm, check their website for more information. Take a seat and enjoy the magnificent view, the only decision you have to take for now is whether you would love to eat Lemon or Orange Cake? I go swimming every day; in total I swim 15 hours or so. As I glide seemingly weightless through the refreshing cold of the water, I think of Nikos Kazantzakis words “happy is the human, I thought, who, before dying, is found worthy to sail the Aegean Sea.” I know I’m not a sailing boat, but this is exactly how I feel, totally grateful; there is nothing else at all I would want to do in this exact moment. Super cute store right in the middle of Lindos. Kaftans, Pashminas, Jewellery …. Browse summer dresses from Madame ShouShou by designer Elena Kordali. Try sandals by designer Aris Tsoubos, the pompom ones are adorable. Check out the newest bikini styles from ckantova by designer Christina Kantova. Pick whatever you fancy in this super cute store, and feel good about it, everything in this store is made in Greece. Opening Hours 9am till 11pm (in summer), please check their website for more info. I love to stay in casual but stylish surroundings where I can sleep on an eco-mattress and use eco-cosmetic products. Every day I wake up in my white and light grey designed room, I think what a lucky person I am; it looks delicious together with the deep blue of the sky. Breakfast is extensive and full of Greek treats, the view from the bright white rooftop terrace over the village, the Acropolis and the Mediterranean Sea is simply magnificent. I love my daily walks through the village to go for coffees, to a restaurant, or to the beach, and I love to come back late at night, when there are only the stars and a few cats around. Check their website for more info, I booked my stay online directly with them. Over the course of my visit I found out that each of the cats lives in their very own district of the village. I became friendly with some, since it was always the same cats at certain points along my route. I wish I could have taken one of them home. I spent my evenings eating at some of the best restaurants in Lindos, read all about it here Travel Greece. Where to eat in Lindos on the island of Rhodes. Warning: You might get very hungry reading this. What do you like to do in Greece?